We were stuck and can't get back to the office after lunch. 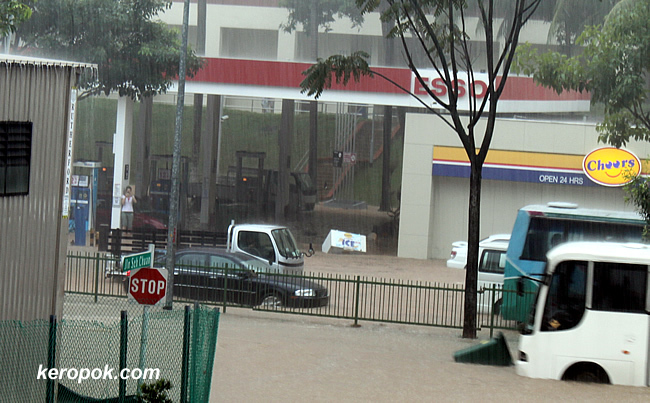 We walked to the corner and saw that Jalan Jurong Kechil was flooded. See that white box with the word ICE? That's the freezer from the Cheers convenience store that contains the ice. That box is usually located next to the entrance, now it's floating away! WAH so that's what I missed when I left my place about 2.30pm... The flood subsided by then! Were you sleeping till 2.30 pm? LOL. Watch the youtube by Anon below! Wow! That is 100% the same lady! How did you find this video? the world is so connected now eh?